The serviceability of concrete structures is a coupled problem in which fracture and damage are coupled with several environmental attacks. In this chapter, we start with the investigation of chemo-mechanical damage due to calcium leaching. We show that the fracture characteristics, namely the internal length in continuum models evolve with ageing. This observation is confirmed with experiments on model materials. Acoustic emission data and size effect tests data are strongly correlated with the evolution of the microstructure of the material. This chapter concludes on some creep tests designed to investigate the coupled effect between creep and fracture. 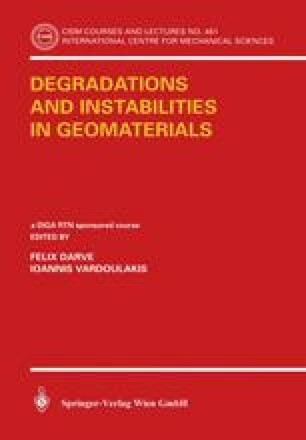 Diez, P., Arroyo, M., Huerta, A., 2002, Adaptive Simulation of the Coupled ChemoMechanical Concrete Degradation, Proceedings of the Fifth World Congress on Computational Mechanics (WCCM V), July 7–12, 2002, Vienna, Austria, Editors: Mang, H.A. ; Rammerstorfer, F.G.; Eberhardsteiner, J., Publisher: Vienna University of Technology, Austria, ISBN 3–9501554–0–6, http://Iwccm.tuwien.ac.at.